How to Become a "Non-Degree Engineer"
Call me a snob, but IMHO except for rare circumstances, if you expect to hold the title of 'engineer,' you really should have earned a college degree in engineering. Sure, there are talented people without an engineering degree that can do some engineering jobs more competently than some with an engineering degree; however, it certainly is not so in the majority of instances. It is foolish to look around at all the technology you share your life with and conclude that people without the benefit of a formal engineering education could turn out so much at such a fast pace. When someone learns that you are an engineer, there is an automatic assumption that you hold at least a Bachelor's degree in engineering, software, or the physical sciences. If you tell someone you are a technician, the assumption is that you have earned an Associate's degree and/or received training in the military specific to your job's nature. When I see messages like the one in this advertisement, I get a little perturbed because: 1) It is misleading since unaware people will believe that becoming an engineer really is a easy as taking some home instruction courses, and 2) It diminishes the accomplishments, financial and time investment, and hard work of those who did earn an engineering degree. Yes, I know Merriam-Webster does not specify that a formal college degree is necessary to hold the title of 'engineer,' but at least in the realms of work performed by most RF Cafe visitors, the practice will not be greeted warmly ... unless your 'other' job driving a locomotive for a living. I'm just say'n. 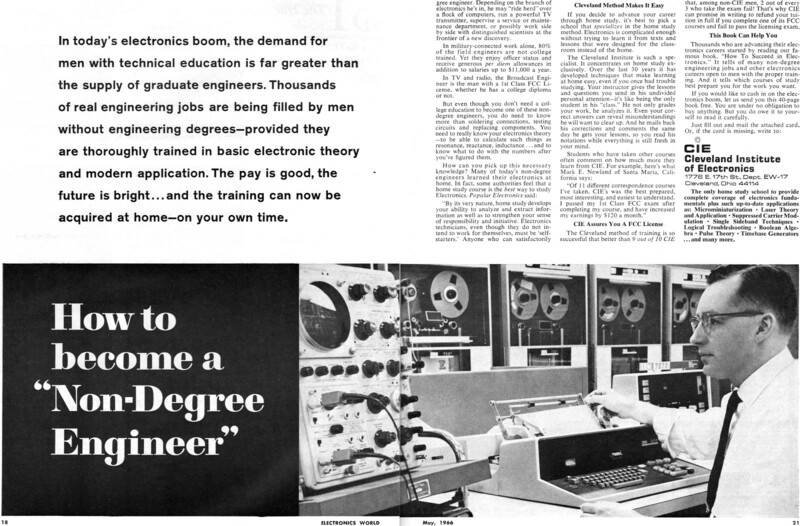 In today's electronics boom, the demand for men with technical education is far greater than the supply of graduate engineers. 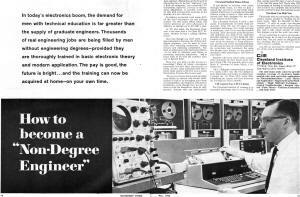 Thousands of real engineering jobs are being filled by men without engineering degrees-provided they are thoroughly trained in basic electronic theory and modern application. The pay is good, the future is bright ... and the training can now be acquired at home - on your own time. The electronics boom has created a new breed of professional man - the non-degree engineer. Depending on the branch of electronics he's in, he may "ride herd" over a flock of computers, run a powerful TV transmitter, supervise a service or maintenance department, or possibly work side by side with distinguished scientists at the frontier of a new discovery. In military-connected work alone, 80% of the field engineers are not college trained. Yet they enjoy officer status and receive generous per diem allowances in addition to salaries up to $11,000 a year. In TV and radio, the Broadcast Engineer is the man with a 1st Class FCC License, whether he has a college diploma or not. But even though you don't need a college education to become one of these non-degree engineers, you do need to know more than soldering connections, testing circuits and replacing components. You need to really know your electronics theory - to be able to calculate such things as resonance, reactance, inductance ... and to know what to do with the numbers after you've figured them. "By its very nature, home study develops your ability to analyze and extract information as well as to strengthen your sense of responsibility and initiative. Electronics technicians, even though they do not intend to work for themselves, must be 'self-starters.' Anyone who can satisfactorily complete a home study course in electron­ics need have no worry about his initiative." If you decide to advance your career through home study, it's best to pick a school that specializes in the home study method. Electronics is complicated enough without trying to learn it from texts and lessons that were designed for the classroom instead of the home. The Cleveland Institute is such a specialist. It concentrates on home study exclusively. Over the last 30 years it has developed techniques that make learning at home easy, even if you once had trouble studying. Your instructor gives the lessons and questions you send in his undivided personal attention - it's like being the only student in his "class." He not only grades your work, he analyzes it. Even your correct answers can reveal misunderstandings he will want to clear up. And he mails back his corrections and comments the same day he gets your lessons, so you read his notations while everything is still fresh in your mind. "Of 11 different correspondence courses I've taken, CIE's was the best prepared, most interesting, and easiest to understand. I passed my 1st Class FCC exam after completing my course, and have increased my earnings by $120 a month." CIE Assures You A FCC License. The Cleveland method of training is so successful that better than 9 out of 10 CIE men who take the FCC exam pass it - and on their first try. This is despite the fact that, among non-CIE men, 2 out of every 3 who take the exam fail! That's why CIE can promise in writing to refund your tuition in full if you complete one of its FCC courses and fail to pass the licensing exam. Thousands who are advancing their electronics careers started by reading our famous book, "How To Succeed in Electronics." It tells of many non-degree engineering jobs and other electronics careers open to men with the proper training. And it tells which courses of study best prepare you for the work you want. 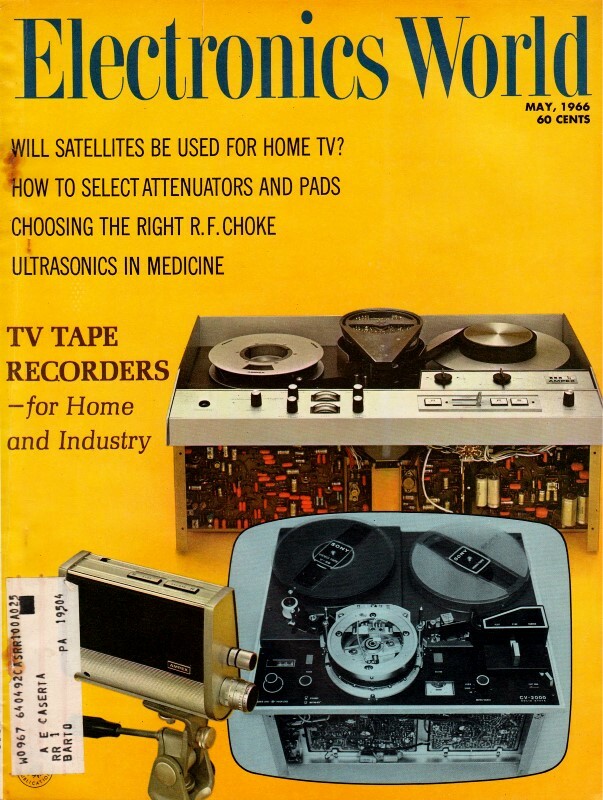 If you would like to cash in on the electronics boom, let us send you this 40-page book free. You are under no obligation to buy anything. But you do owe it to yourself to read it carefully. Just fill out and mail the attached card. The only home study school to provide complete coverage of electronics fundamentals plus such up-to-date applications as: Microminiaturization • Laser Theory and Application • Suppressed Carrier Modulation • Single Sideband Techniques • Logical Troubleshooting • Boolean Algebra • Pulse Theory • Timebase Generators ... and many more.